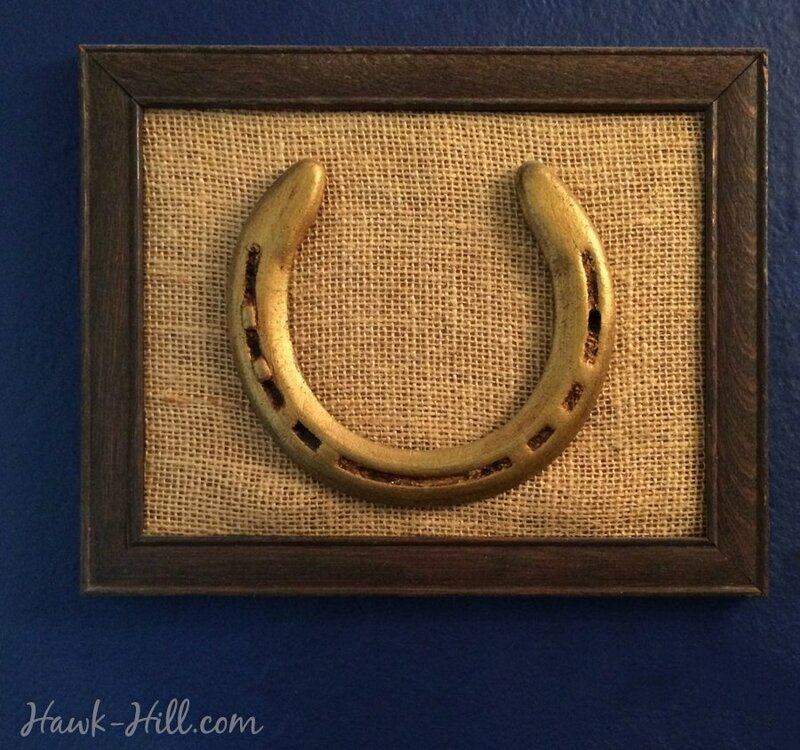 This framed horse shoe is one of my dearest possessions, but taking it from the rusty mess I found in my horses’s pasture to this elegantly framed piece took several steps and a bit of creativity. I realized I’ve written a few posts outlining individual steps to take cool-looking rusty metal objects like equestrian bits or horse shoes from unusable condition to display as art, but I’ve never outlined the process start to finish. Because I have photographs of this horse shoe at almost every step, I’m going to walk you through these individual steps I took to turn this horse shoe from my first horse from a trash-bound rust-covered piece into a sentimental treasure. This is a brief rundown, for expanded and detailed instructions I’ll include links to the individual tutorials for each step. This was what my horse shoe looked like when I discovered it in the field. Pulled off his hoof one day when my horse was at play, the elements had caused it to rust pretty fully, as you can see in the photo. However I’d recently been experimenting with using citric acid to remove rust from metal, so used my citric acid method which you can read about in detail here to take the rust off the steel horse shoe. 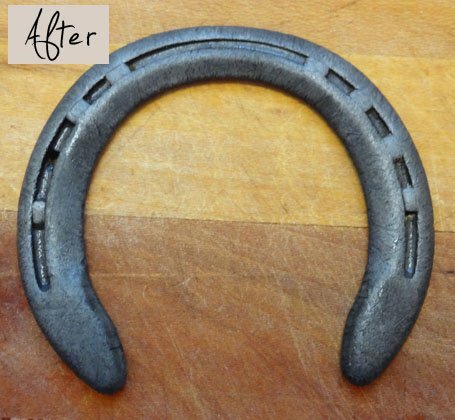 After the rust removing treatment, my horse shoe was left with a raw steel finish- messy and likely to rust immediately, it needed a finish coat. Clear lacquer would have been a find choice for displaying in a more industrial/schoolhouse style home, but my whimsical decor used antique gold elements throughout the house, so to tie my horse shoe in to the decor, I went gold. 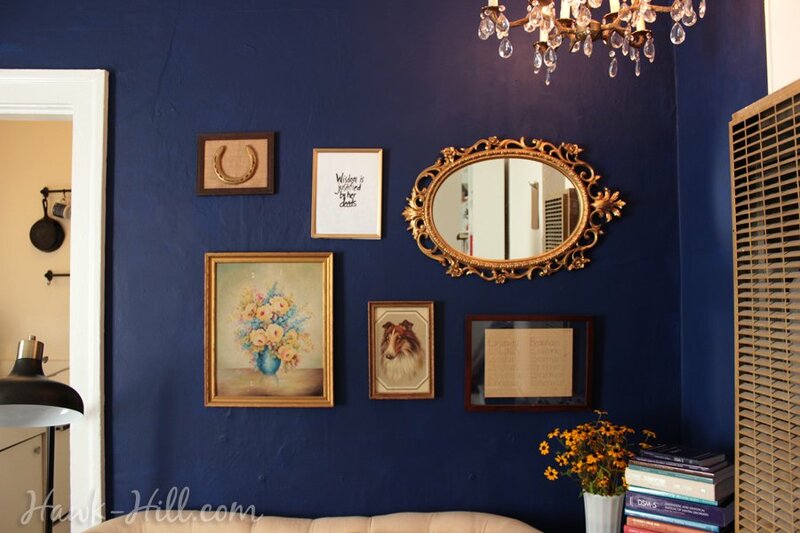 I don’t have a photo of the process of painting and antiquing my steel horse shoe, but the process was almost identical to my tutorial on creating antique gold frames from cheap thrift store frames. 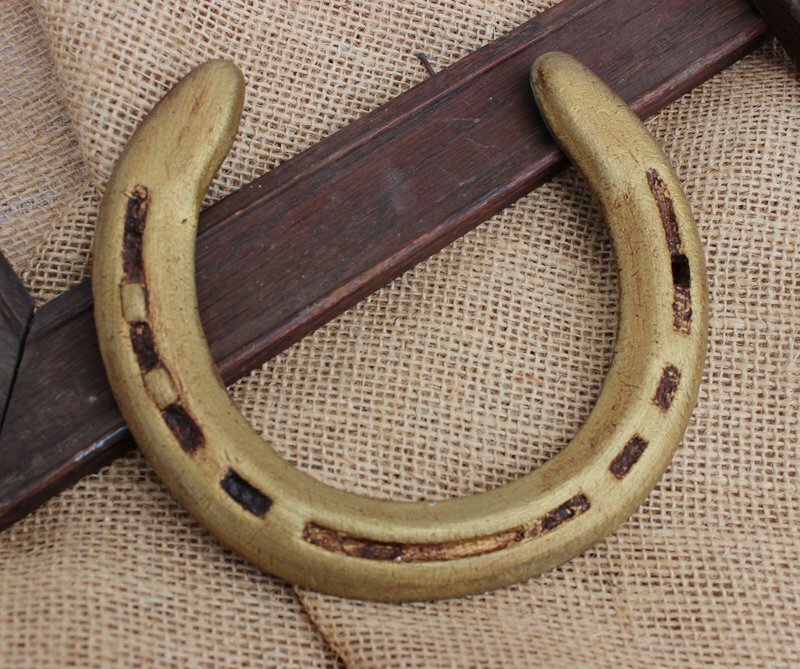 The primary difference was that instead of spraying the horse shoe with a gold foil spraypaint, I used Metallic Gold Acrylic Paint and a paintbrush to paint the gold into the tight crevices of the horse shoe. After the gold paint dried, I used my antiquing method of applying thick Liquitex burnt umber acrylic paint. The Liquitex works better than craft paint because it is thick (as viscose as toothpaste but smoother) and highly pigmented. Both the thickness and pigment help it leave a significant amount of color behind when it is wiped off with a clean paper towel. I like this method because it not only leaves antiquing in the recesses but also just a tad in the highlights. On a used horse shoe with many scrapes and pits, this creates a really interesting effect. 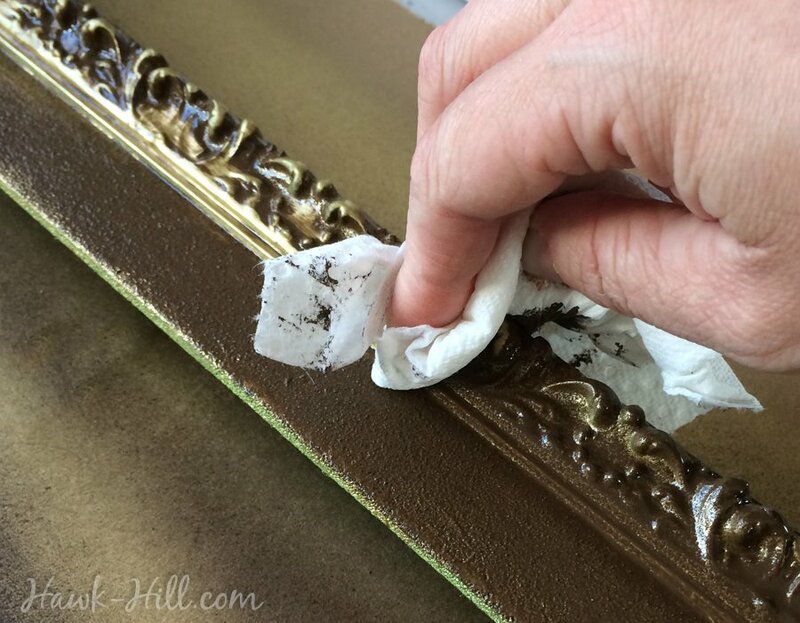 After your horse shoe is painted and, in the process of painting, preserved against future rusting, you can mount it using a frame, some cardboard, and some backdrop fabric. The full tutorial for DIY horse shoe framing can be found here. When you’ve completed framing, you have a classy keepsake that’s beautiful and sentimental. Horse shoes preserved and framed in this method make amazing gifts for the horse owners in your life. And I particularly love how they look placed on a gallery wall with other equestrian elements. I think you probably could! 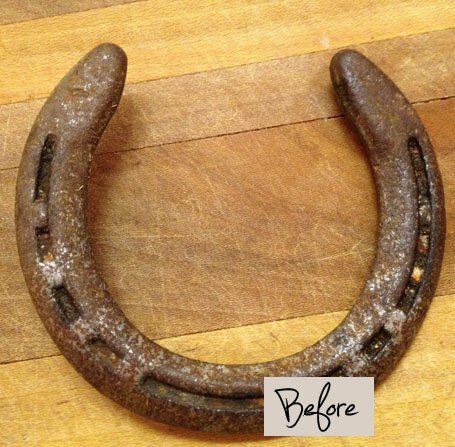 Personally, I’d clean off the rust first, then apply a clear coat to seal the finish, then apply the gold leaf to the horseshoe when the clear coat was dry.